Toyota’s new i-Road personal mobility vehicle (PMV) makes its debut at Geneva, and its maker promises the tandem two-seat, three-wheel all-electric commuter vehicle is. 'a new, flexible form of transport designed for city streets'. 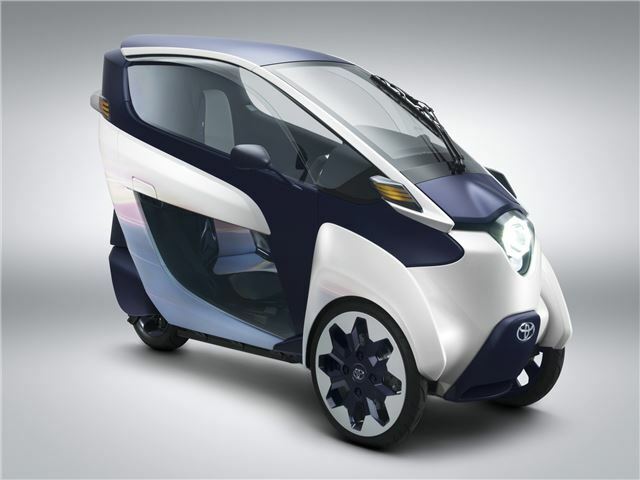 The i-Road is the latest concept to emerge from Toyota, and caters for people who want something that is more comfortable and offers better weather protection than a traditonal motorcycle. It's tiny and perfect for city streets, measuring 2350mm long and 1445mm high, and - impressively - just 850mm wide. That makes it marginally wider than a motorcyle, and is perfect for city traffic. The zero-emissions powertrain uses a lithium-ion battery to power two 2kW motors, offers a range is around 30 miles, and can be recharged from a conventional domestic power supply in three hours. The i-Road features Active Lean technology, a system that uses an ECU to calculate how much lean the i-Road needs in every corner. Its three-wheel stance also means that the rider/driver does not need to put their feet on the ground at rest, meaning the rider/wider doesn't need to wear a helmet, and the bodywork can be fully-enclosing. There's no work yet as to whether the i-Road will go on sale, and if so, how much it will cost.